Hey, guess what? The Idle Loaf is now self-hosted. That’s pretty neat, right? You can update your feed subscription here. Thanks for following me over there! I get things in my head. Once they’re in there, I can’t get rid of them. 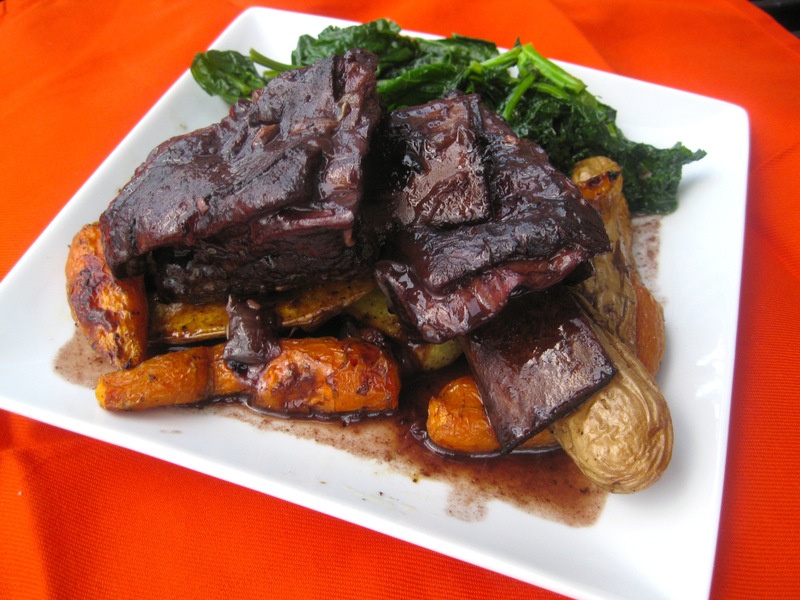 And since our return from San Francisco, I’ve had braised short ribs on my mind. Probably because I was obsessed with the braised short rib poutine at Wayfare Tavern. Maybe also because I thought they’d go perfectly with our bottle of Malbec from Wattle Creek. 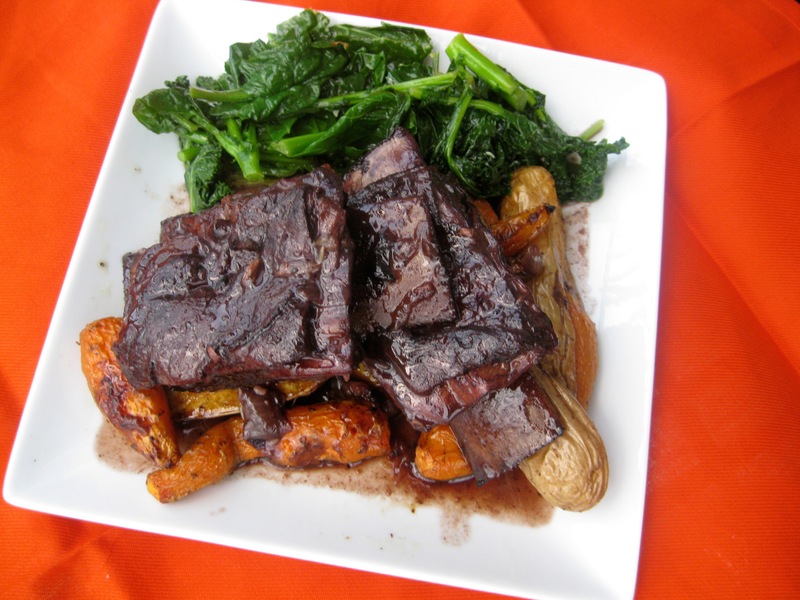 So when I came across beef short ribs from Sea Breeze Farm at the farmers market yesterday, we decided to grab some. I had some notion that I was going to braise them, but I wasn’t sure what to serve them with. I considered goat cheese polenta, a la The Pioneer Woman, but inspiration came from the root vegetables still filling the market stands. 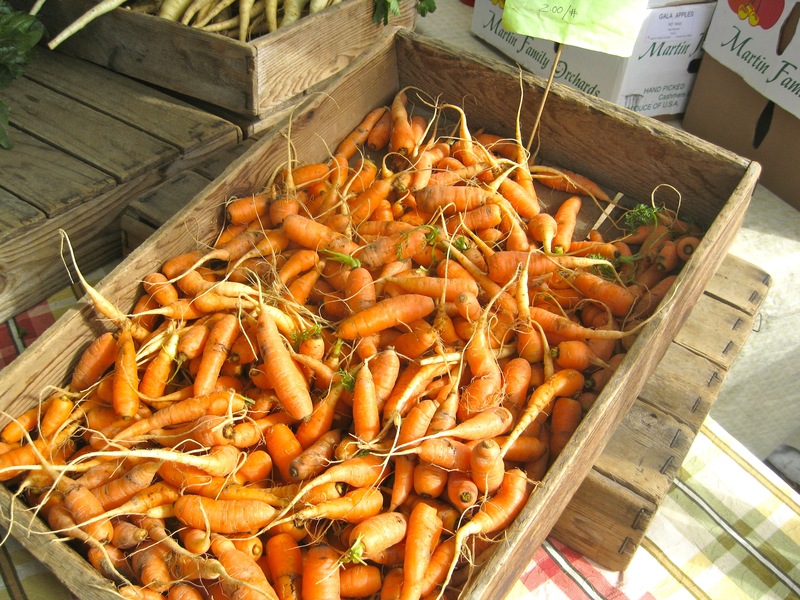 Some fingerling potatoes, adorable baby carrots, and half a bag of braising greens and we were ready to go. 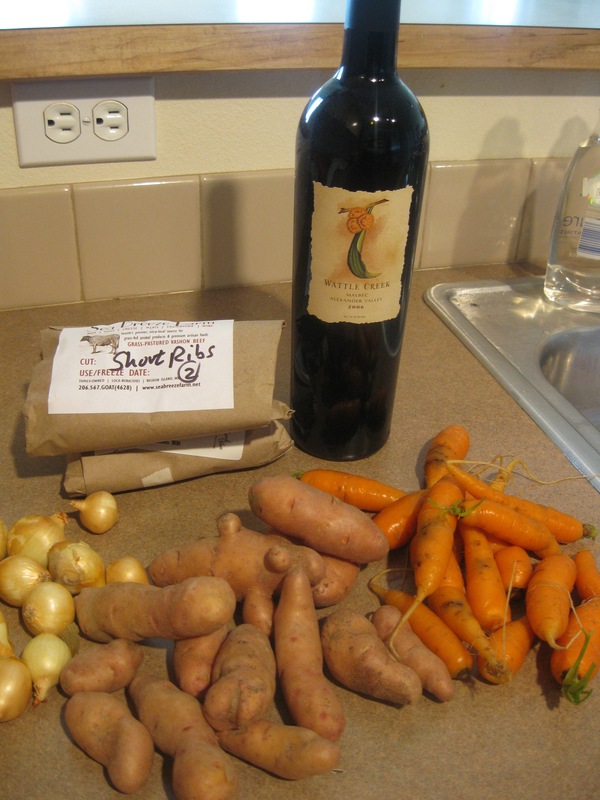 Here are the makings of a great main dish. Mix together flour, salt and pepper and place in plastic bag. Add ribs to bag and shake to coat. Cook ribs about 45 seconds on each side, until browned. Add onions and garlic to the pot and saute until slightly browned and softened, about 5 minutes. Add beef stock and wine and bring to a boil. Boil for a few minutes to burn off alcohol and reduce a bit. Add ribs back into the pot and put a lid on it. Place covered dutch oven into the oven and cook for 2.5 hours. Taste a bit of the sauce and add salt and pepper in desired. Skim fat off the top. Serve warm with whatever you want. While all that was going on, I washed the potatoes and carrots and tossed them with olive oil, salt and pepper. When the ribs were done, I roasted the veg in the oven at 400 for 30 minutes. At the last minute Brent also sautéed the greens to complete the meal. Yeah. Craving fulfilled. Served alongside with the rest of that Malbec, this made a very satisfying dinner. I’m glad we finally indulged my craving, but I don’t think we’ll be making short ribs again any time soon. They were definitely much fattier than my normal fare, which is not really my thing. Yesterday Brent and I had to take advantage of the unexpected sunshine and get outside. 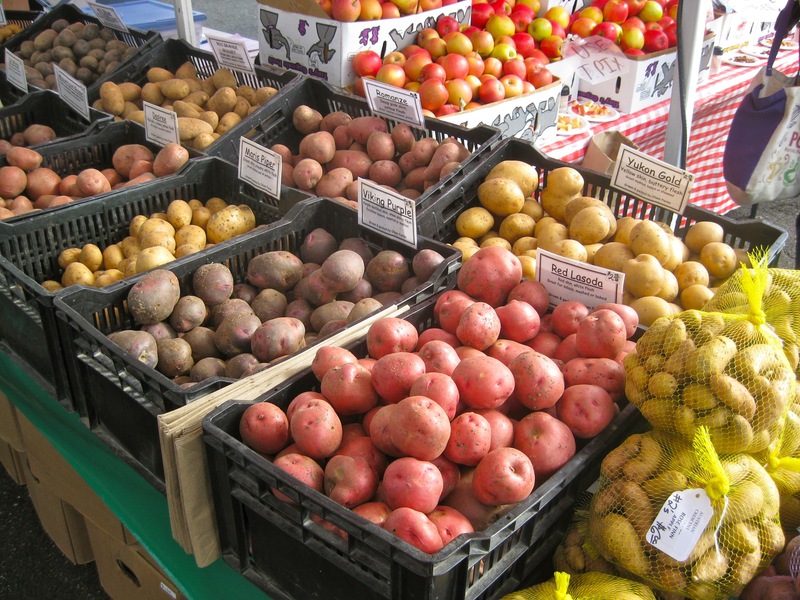 We hopped a bus to the University District to check out their farmers market. 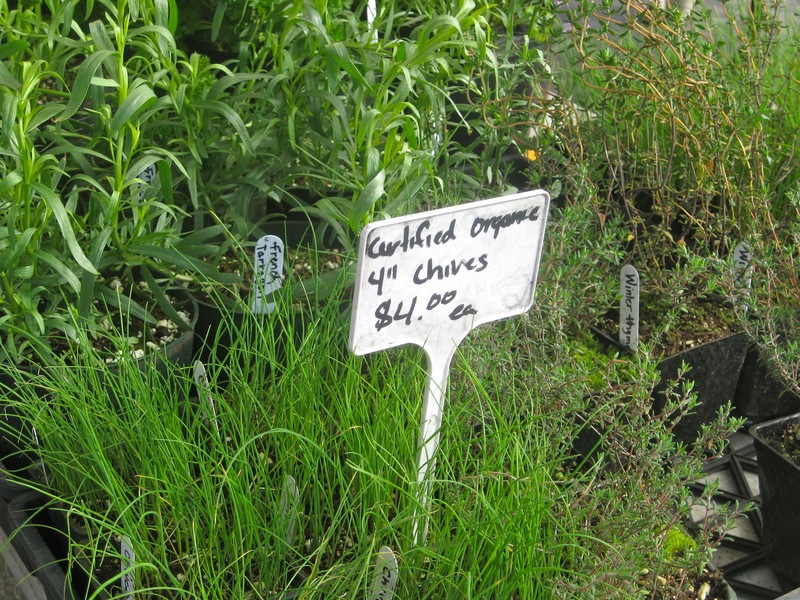 My usual weekend farmers market is the Ballard farmers market, but it’s always nice to diversify, right? The U-district’s market was pretty bustling (due to the sunshine, no doubt) and we wandered around for quite a bit finding ingredients for dinner (more on that in a later post). 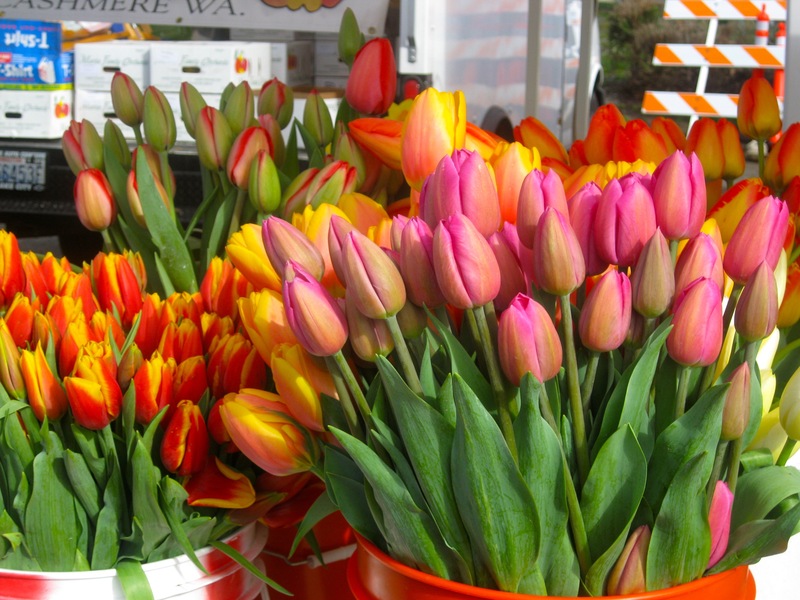 Why didn’t I buy huge buckets of tulips to bring in to my house? Ahh. Total and instant regret. And I was definitely inspired to bring some green onto my balcony. I need to plant something soon. 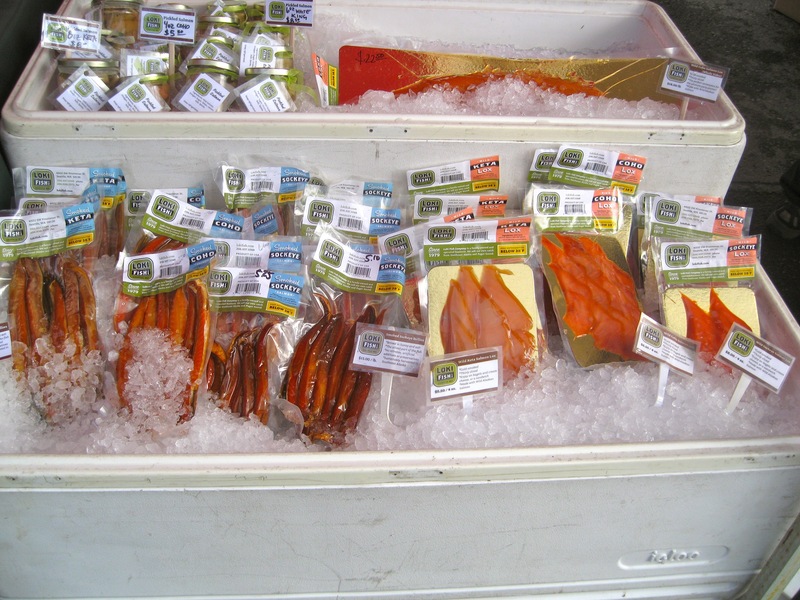 Of course I also picked up some smoked salmon. It’s nearly all I eat since moving here! The bus we take from the U-district back to our hood goes right through Fremont so we decided to hop off for a quick snack and a beer. I brought Brent to Pie so we could split a mini pie. He chose the veggie pot pie, which was quite delicious but lacking a tiny bit of salt. I still need to go back to try the macaroni & cheese pie. 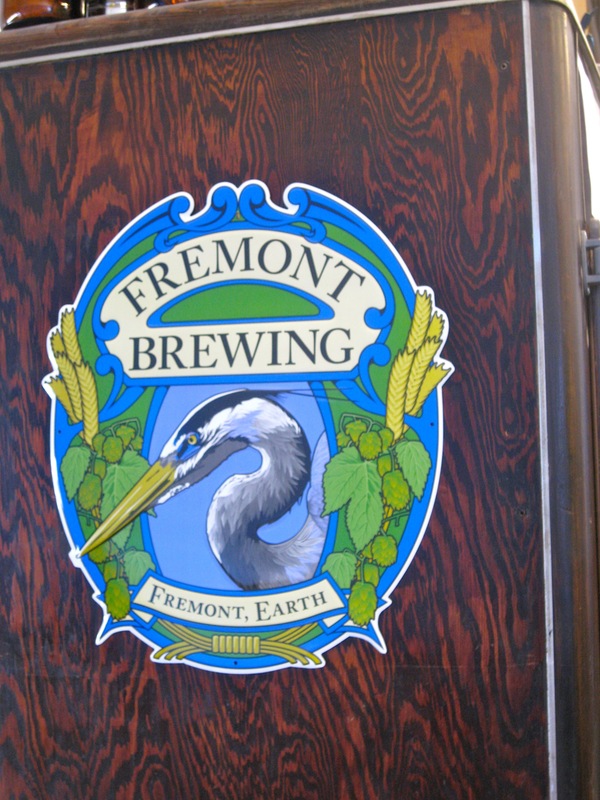 I love Fremont Brewing, so I was more than happy to stop in to check out their new seasonal release. I had nearly a whole pint of the Summer Solstice seasonal (described as tangerine flower in a glass), which was super refreshing, and Brent enjoyed The Brother Imperial IPA and later bought a growler to take home and enjoy during the Final Four games. Their Urban Beer Garden is a pretty laid back place. 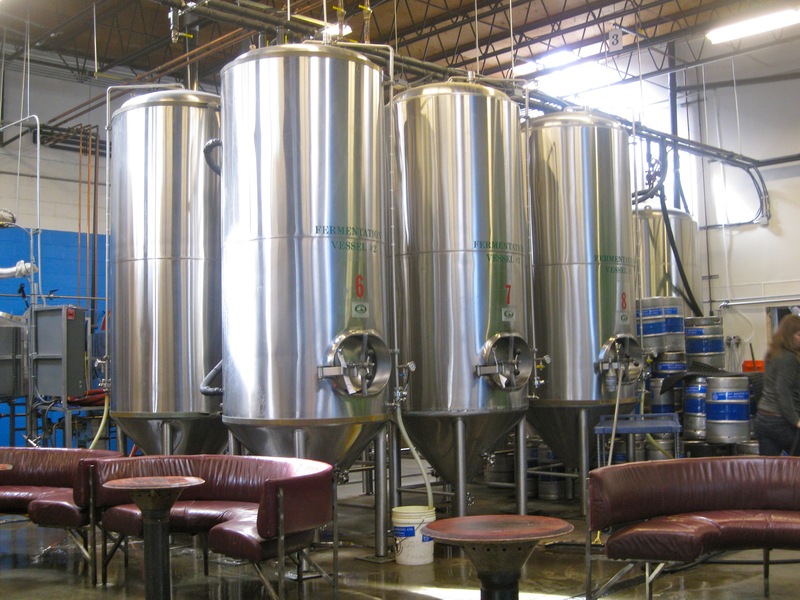 Seating includes wooden picnic tables and garage sale furniture, and you can enjoy the view of the fermentation tanks while you sip. 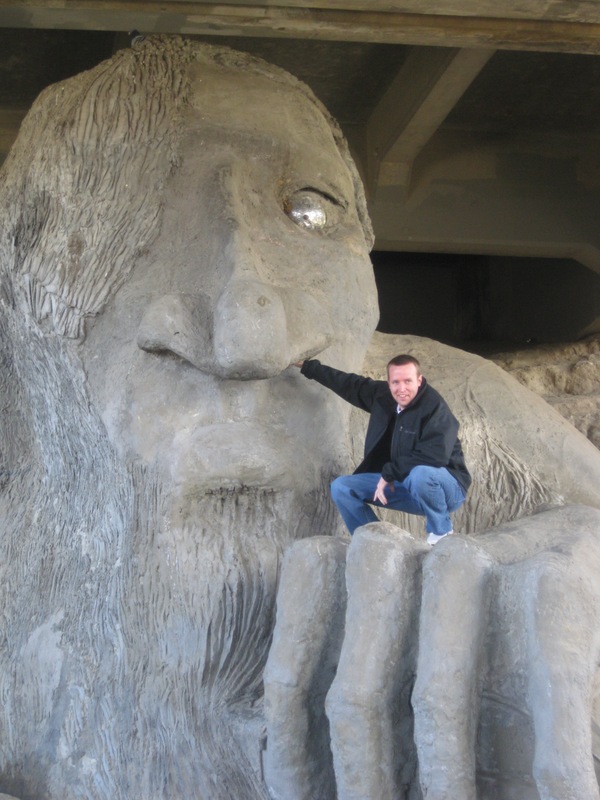 Oh, and “since we were in the area” Brent decided he was interested in visiting the troll after all, so we had to snap a photo of that. Our day wasn’t over, however. 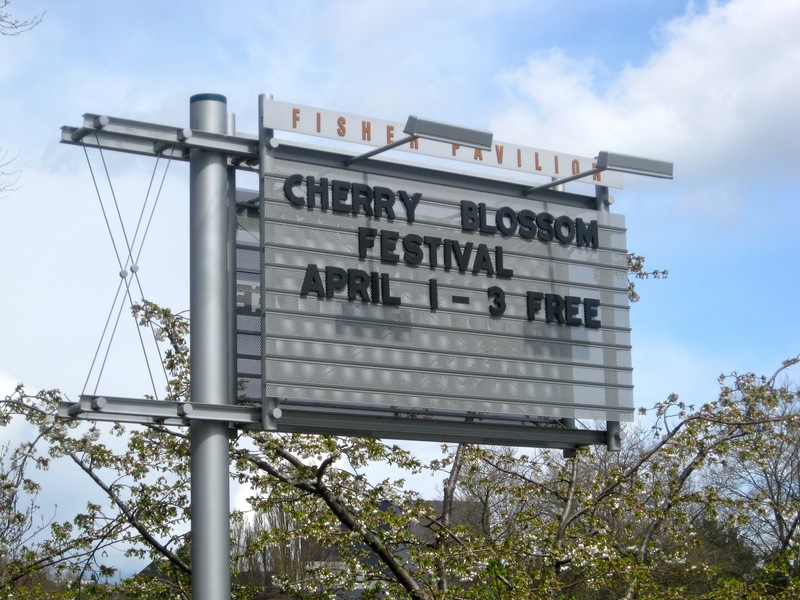 The sun was still shining when we finally got back home, so we took Larry out for a walk to Seattle Center to check out the Cherry Blossom Festival. The festival ended up just being a few food stands and a group of performers who weren’t performing, but we still had a nice time. 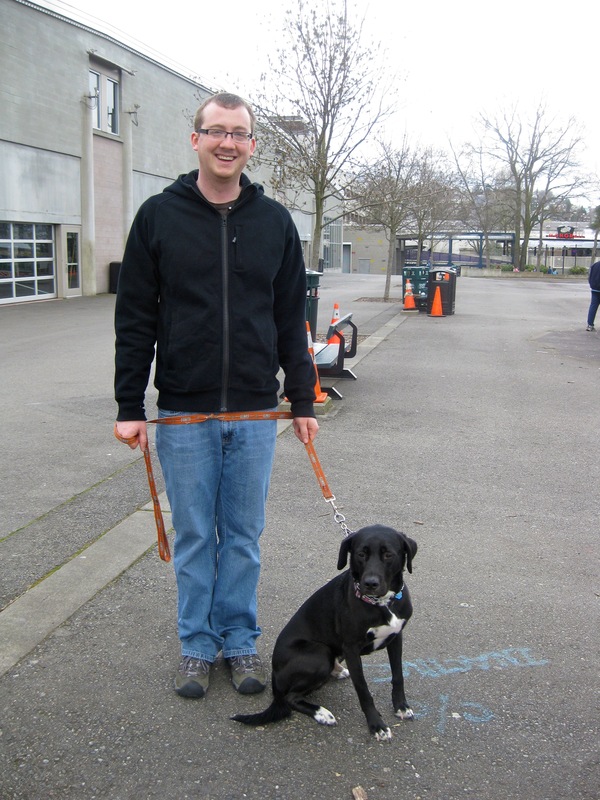 AND Larry was very well-behaved around the large group of people and dogs. Isn’t Larry funny? He’s sitting because we told him to and he’s obedient, but he’s not happy about it! He always looks so forlorn when we make him sit. He’d rather be running. 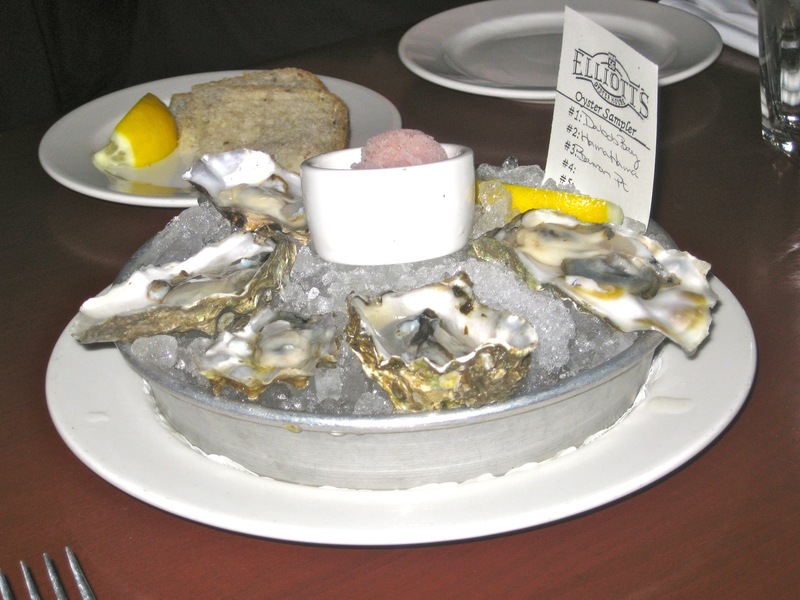 An iconic Seattle waterfront restaurant, Elliott’s has been on our radar for a while. We’ve often talked about going to their Progressive Oyster Happy Hour for inexpensive oysters right on the water, (but of course Brent has that whole “work” thing going on and never gets home in time). 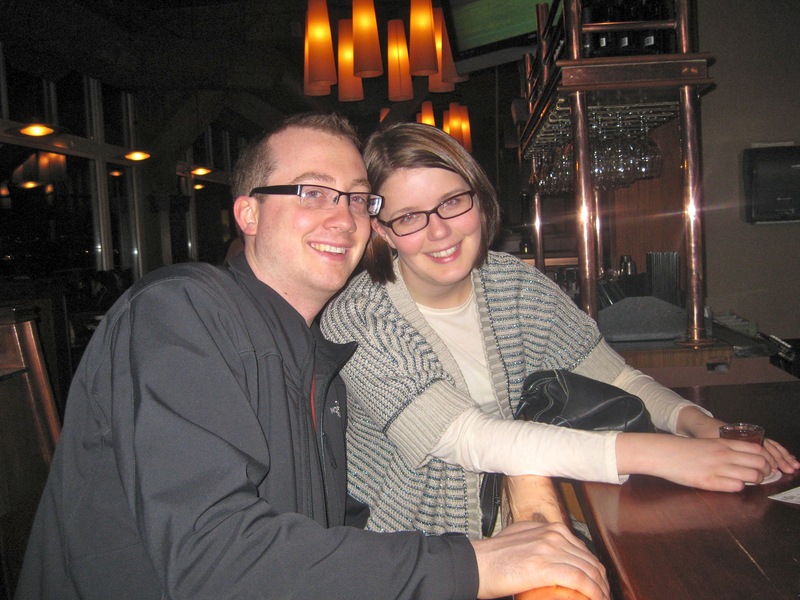 When Pat and Smitha were here, Patrick mentioned they wanted to go to a “nice” seafood restaurant for dinner one night. I suggested Elliott’s because I knew it was close and it had a great reputation. We made reservation for 8:30 on Friday night. 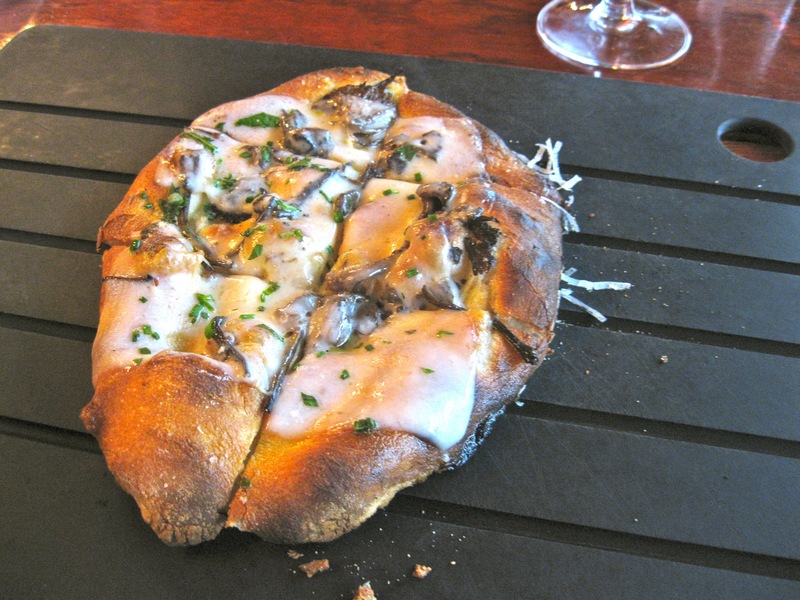 Ambiance: For a place this expensive, I was pleasantly surprised that the restaurant did not seem stuffy. 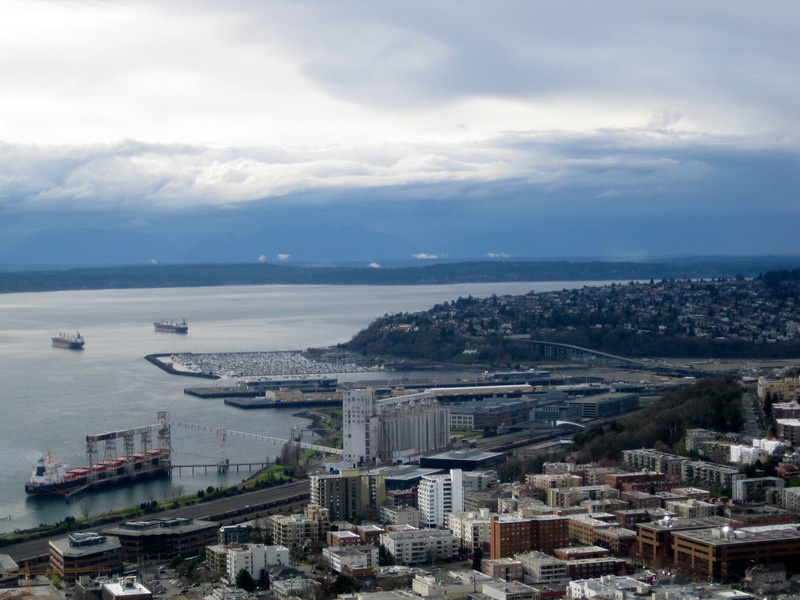 It is definitely a white tablecloth kind of place, but that’s the beauty of Seattle – still plenty of denim and fleece to be found. The restaurant is right on the pier and looks out over the water, which I’m sure is gorgeous in the daylight (or sunset! ), but at night the effect is definitely minimal. We waited for our table in the bar section and grabbed a few drinks. The bar is bustling, but it could use a few more seats. The boys were happy to catch a bit of NCAA action on the two TVs. Service: The service was attentive without being obtrusive. Our waitress seemed very knowledgeable about the menu. She was able to recommend “Northwest specific” choices for our out of town guests and make suggestions between the various menu items. She stayed on top of our drink orders, and we stayed and chatted a bit after paying our check without being rushed out. Food and Drinks: Everyone was happy with their cocktails, which include a seasonal blood orange champaign cocktail, an Elliott’s signature manhattan (Brent’s current drink of choice), and some Pike’s Punch for that vacation feel. 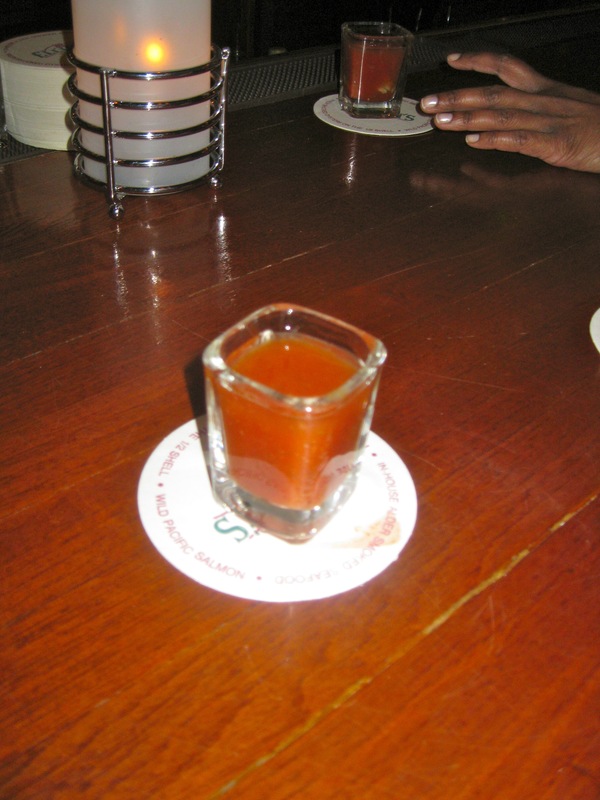 To start, we all (I was peer-pressured) decided to take oyster shooters at the bar while waiting for our table. Well, I, uh, hate bloody marys, so this was so not my thing. Everyone else seemed to find no objection with it though. I think they were $5 each, which can add up really quickly. Once seated, I was determined to get an order of oysters on the half shell. I mean, if you going to an oyster house, you ought to get oysters, right? 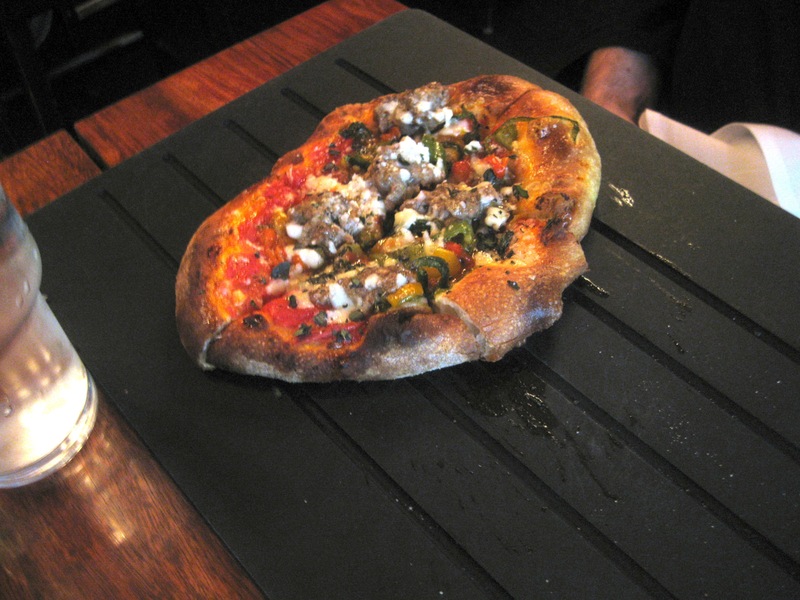 We split a half dozen among our table and we all really loved them! The Hama Hama oysters were so sweet and delicate and I thought the frozen mignonette was a perfect complement. 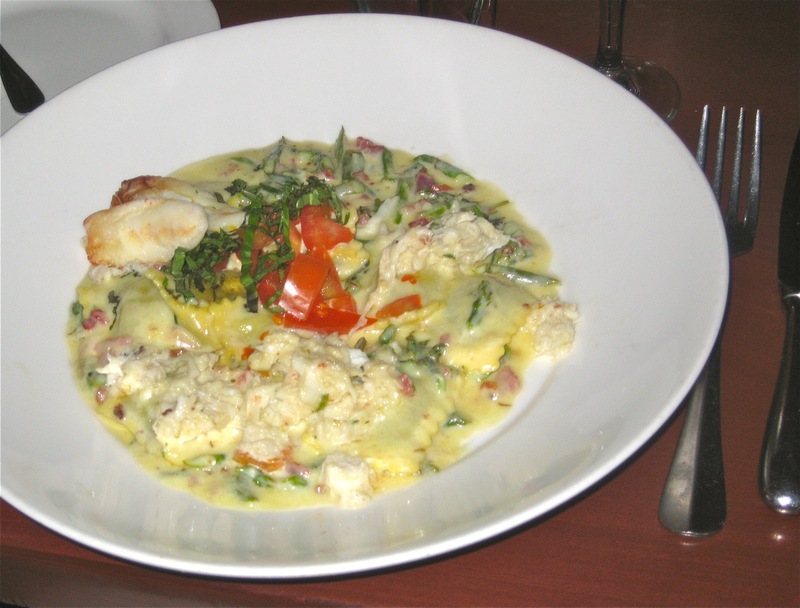 For our entrees, Smitha and I ordered the Wild Mushroom Ravioli with Dungeness Crab | Wild mushroom filled ravioli tossed with Dungeness crab, pancetta and asparagus. 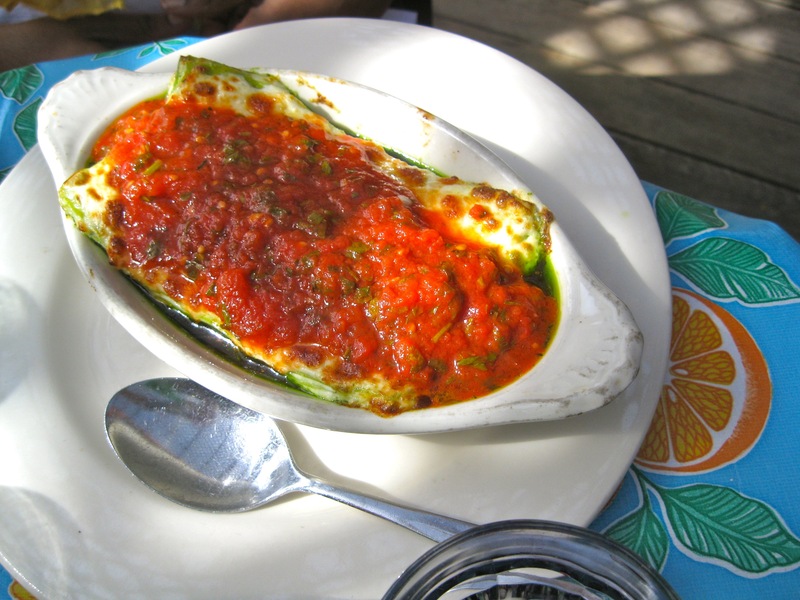 Finished with a light cream sauce or pomodoro sauce and topped with fresh tomato and basil chiffonade. 27. It was good, but I wouldn’t call the cream sauce “light.” Also, I do not know if this was intentional or not, but while the ravioli and sauce were warm, the crab was chilled. I did not enjoy the juxtaposition. Plus I definitely had the “I can’t believe this cost $27” reaction, so the overall effect was just meh. 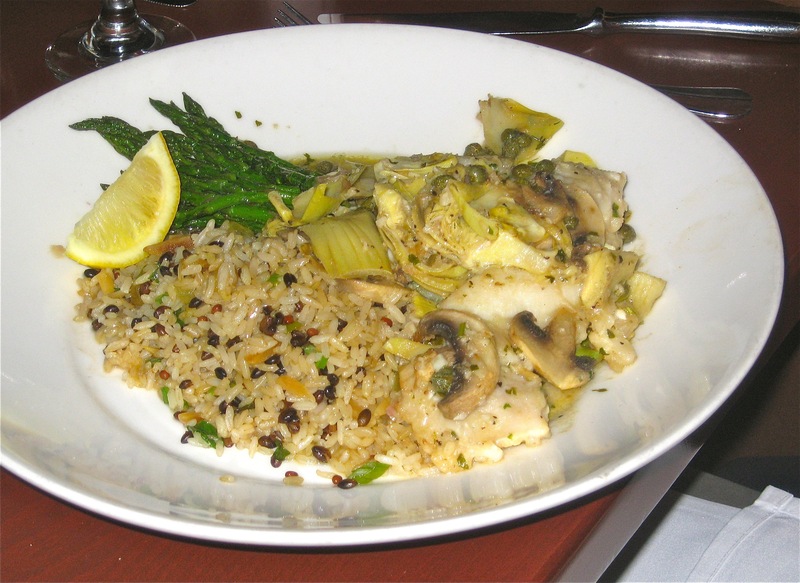 Brent ordered one of the specials which was a halibut cheek piccata. He seemed to enjoy it (minus the rice pilaf which was an obvious afterthought). I had a few bites and the halibut cheeks were flavorful and cooked well. Yep, I promise there are halibut cheeks somewhere under there. Oh, and Pat had an unphotographed steak that he enjoyed (he’s not so much a seafood lover). Overall my impression of Elliott’s is that it’s a place that thinks it is greater than it actually is. The food was not bad, but everything seemed pretty overpriced. I would go back again for the above mentioned Oyster Happy Hour, because their oysters are definitely some of the best I’ve had in Seattle. I would not, however, return for a full dinner. Brent and I (mostly I) had been talking about taking the drive up to Woodinville since moving to Seattle. I knew it was close, but I didn’t realize it was only a 25 minute drive. 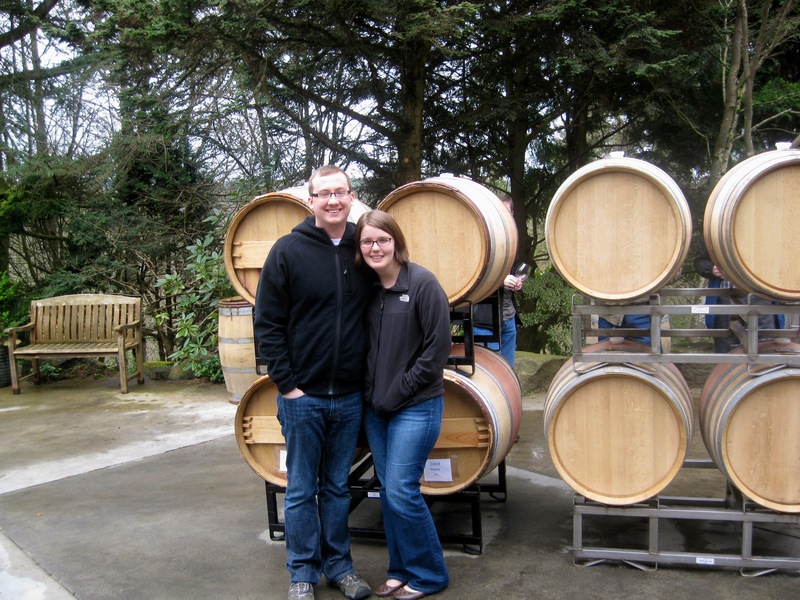 Woodinville is known as the home of several of Washington state’s wineries and you know I’m all about that. 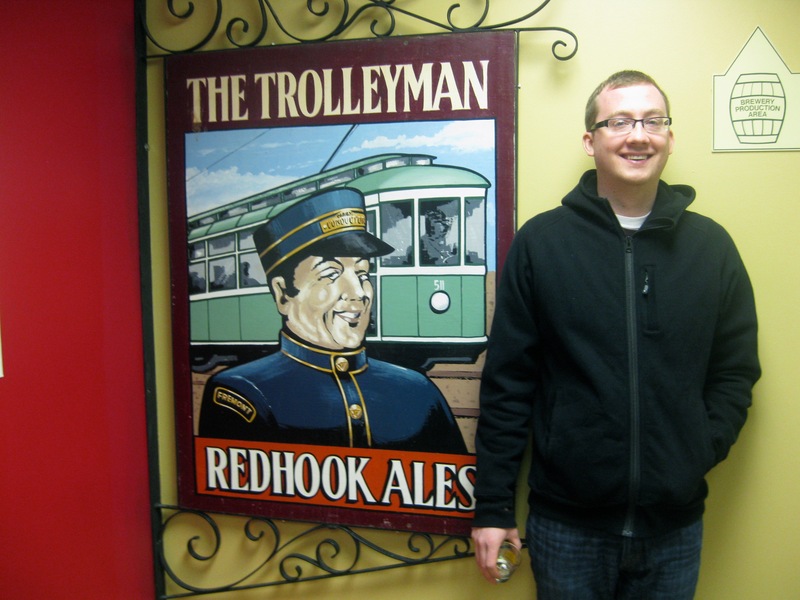 For my beer-drinking husband, it is also home of Red Hook. Patrick, Smitha, Brent and I decided to use Saturday, their last day here, as an opportunity to check it out. The weather was dreary anyway, so sticking around the city was that appealing. 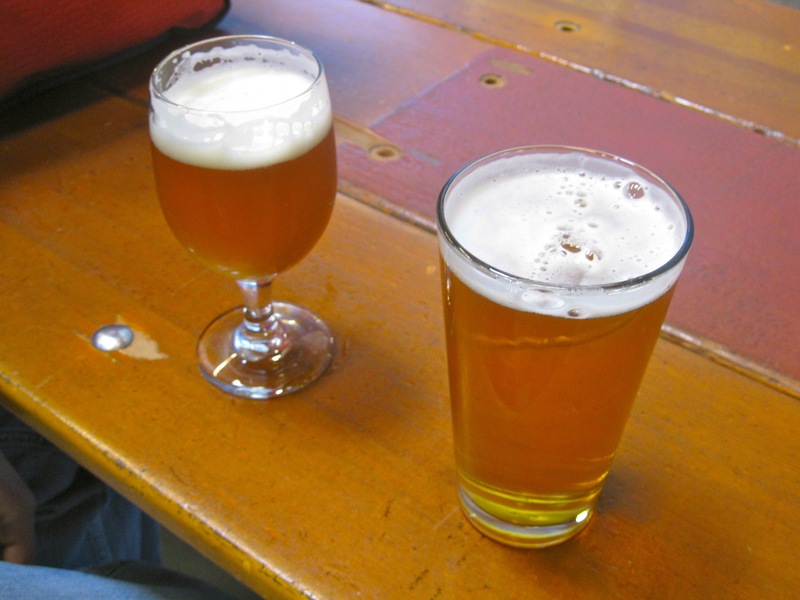 The Red Hook Brewery offers tours on the weekends at 1pm, 3pm and 5pm, and they sell out quick. We arrived a bit before 1pm and were told the 1pm tour was sold out, so we grabbed tickets for the 3pm tour (only $1 each) and headed a block down the road to Chateau Ste. Michelle. Chateau Ste. Michelle also offered a tour, pretty much every 30 minutes. 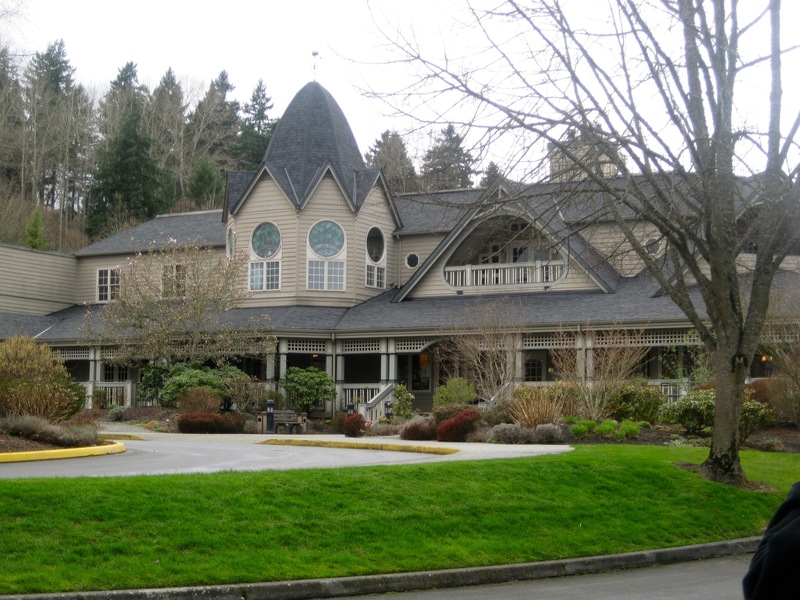 The tour lasts about half an hour and details the wine-making process as well as the specific grape growing regions in Washington. The tour concludes with a tasting of three of their wines and a quick lesson on wine-tasting technique. The tour was absolutely free, but the winery did offer a tasting bar where were able to choose 4 of their wines to taste for $10. Overall I thought Chateau Ste. 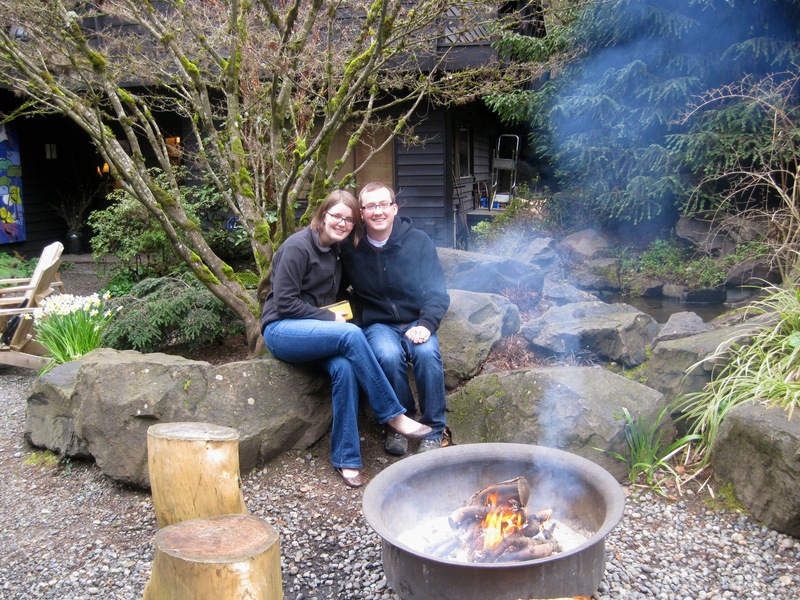 Michelle was a great choice for a visit if you’re in Woodinville. They have really great reislings, including a delicious, perfect-for-dessert, late harvest reisling. 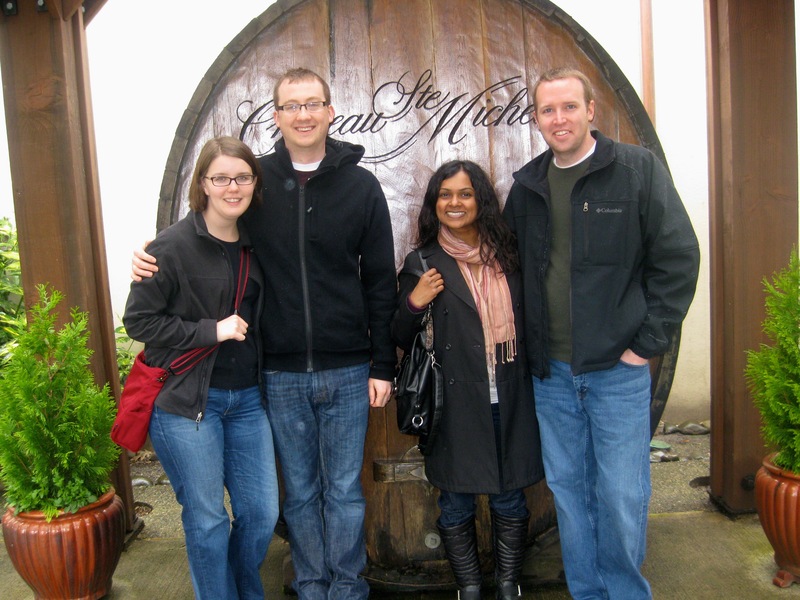 The tour/tasting is a bargain and I learned quite a bit about the region’s vineyards. The grounds are also totally gorgeous. I would have taken more photos, but it was raining. Obviously. After splitting two tastings between the four of us (Brent barely partook – he was our driver) we headed to Red Hook for our tour. Umm… let’s get one thing straight. This is not a tour. They corralled us into a small room, gave us 3oz tastings of 5 different beers and shouted a bit about Red Hook’s history and hops. Clearly quite a deal for only $1, but don’t expect to see anything. Plus the beer is just ok. My favorite were probably the ESB and the spring seasonal nut brown ale. Pat defs took one for the team by finishing a few of my tastings, as well as some of Brent’s, and nearly all of Smitha’s. 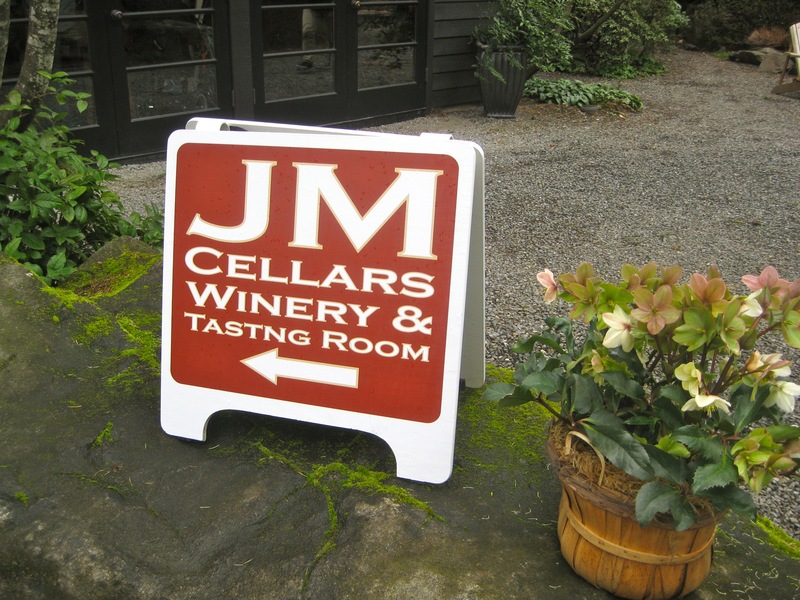 After chowing down on some soft pretzels with beer cheese sauce at the pub (Amazing, by the way) we beat the clock and headed to JM Cellars, which was by far my favorite destination of the day. The grounds are so beautiful and the wine was amazing! For $10 per tasting, we sampled 7 of their releases – 6 reds and 1 white. The Bramble Bump White blend was hands down my favorite of the afternoon. Again we split 2 tastings between the four of us before wandering the grounds taking pictures. Our finally stop of the Woodinville wine tasting tour was Columbia Winery, because it was across the street and open late. I didn’t love anything here, but it was a nice visit. The tasting room is very pretty and comfortable (love a fireplace!) and the tasting was $5 for 4 pours. It’s so cool we have this mini wine country so close to us! I definitely plan on dragging Brent back in the summer when all the wineries have different events and concerts going on. Posted in Uncategorized and tagged Wine, woodinville. Bookmark the permalink. 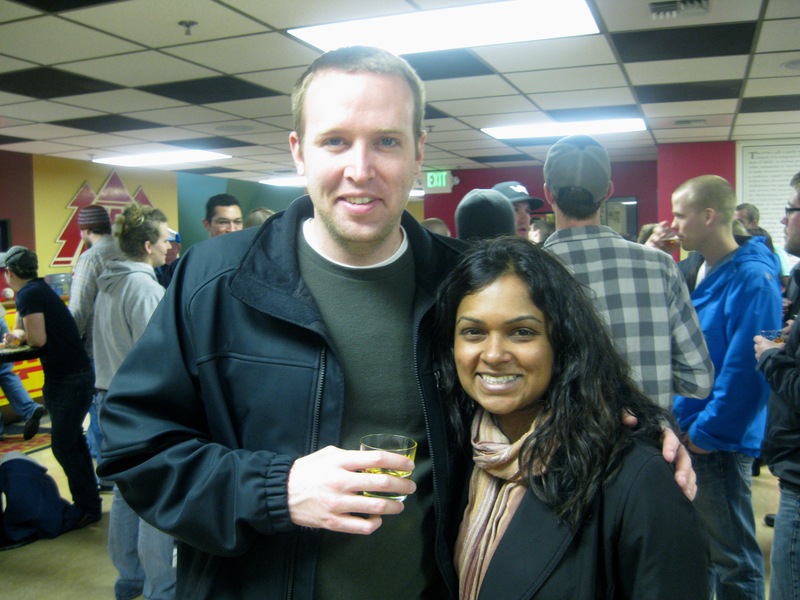 Another part of Patrick and Smitha’s itinerary included a walking tour of some of the other neighborhoods in Seattle. 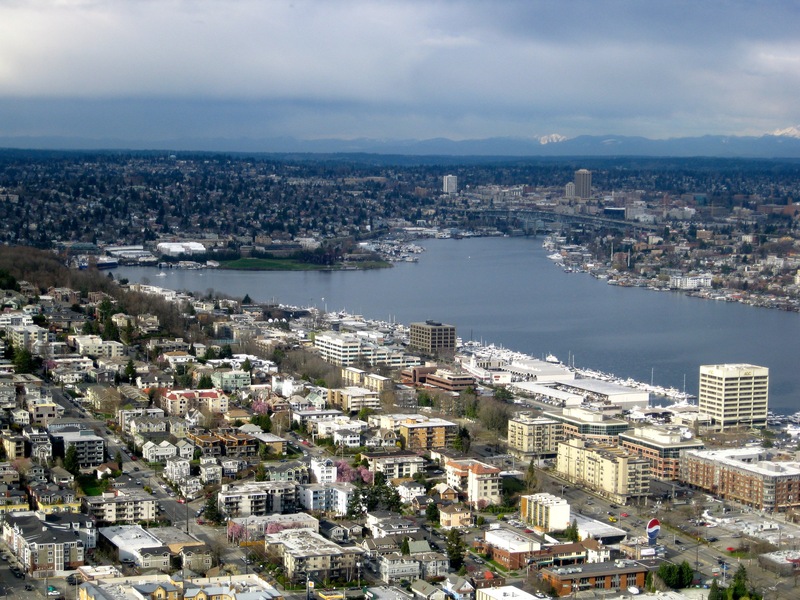 I was definitely game to join them for that because my experience outside of the downtown/Queen Anne area is pretty limited. 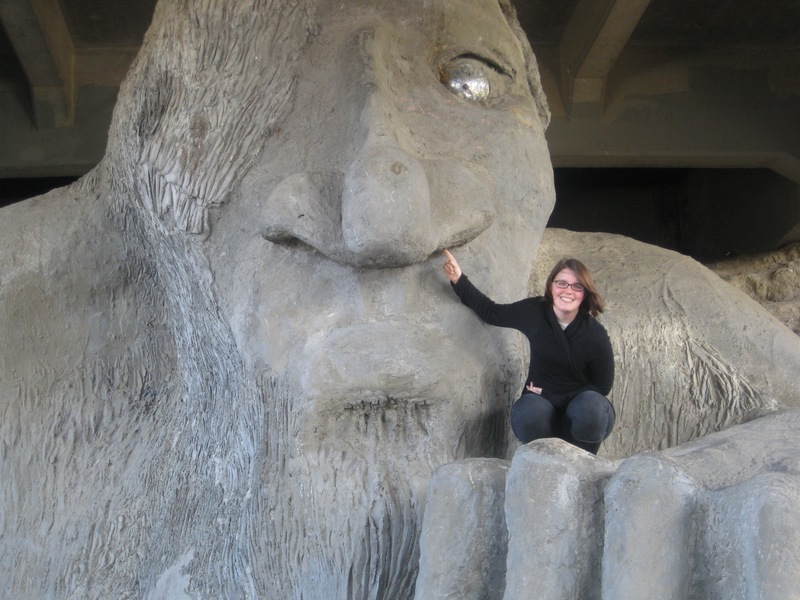 Plus, I had been wanting to see the Fremont troll since we moved here. Our firsts top was Waiting for the Interurban, which residents frequently dress up. I have no pictures, but that’s alright – the sculpture had no fun accessories that day. 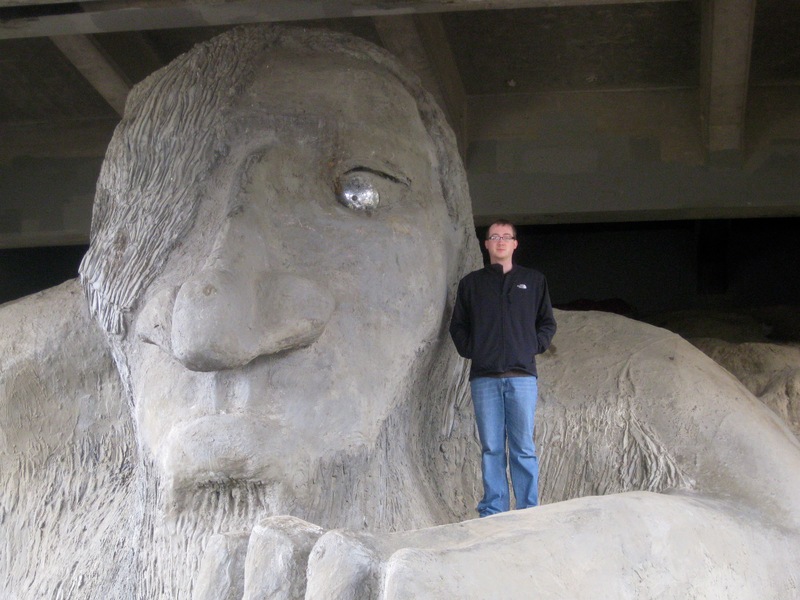 Next up was the highlight of the tour: The Fremont Troll. 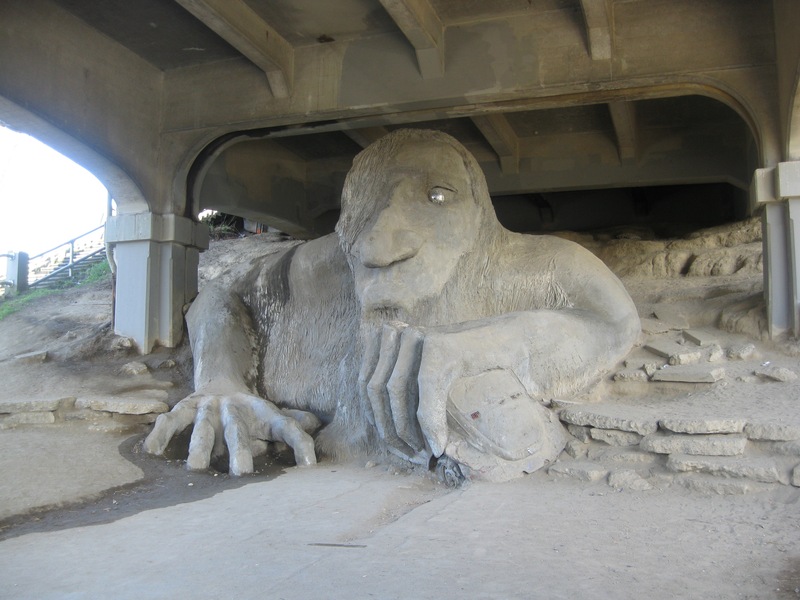 To find the troll, hike up Troll Avenue and you’ll find him lurking beneath the Aurora Bridge. We all took turns climbing on him for various photo ops and then went on our way. We got about 2 blocks away and Pat and I convinced ourselves we needed to go back for one specific photo opportunity: nose picking. My fam is super classy like that. 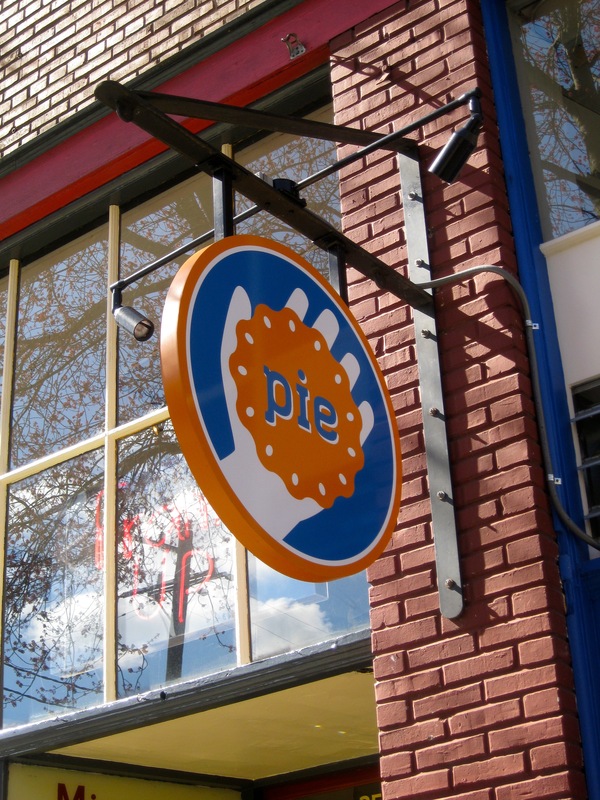 More meandering, including a stop at Pie, where we got to sample the gluten free huevos rancheros pie and the apple pie. I love these tiny pies and I plan on dragging Brent back soon! More sights to see. 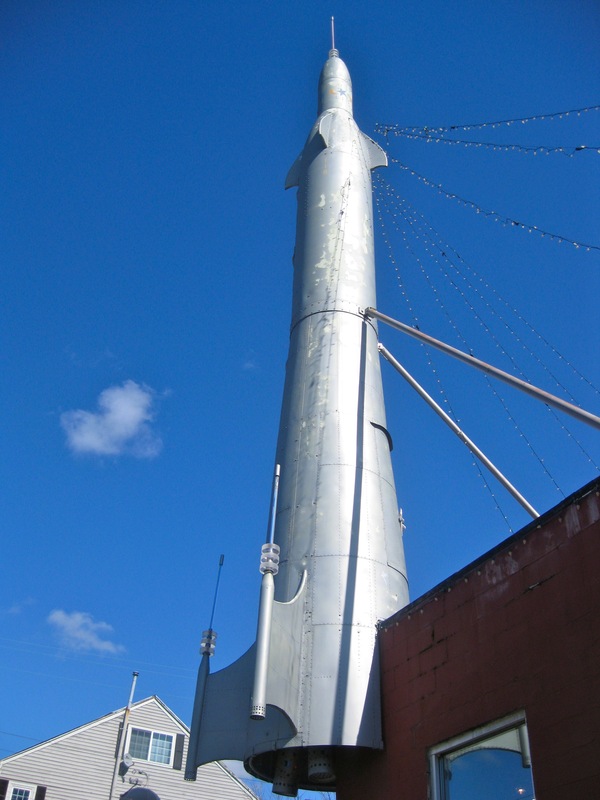 When Pat initially mentioned seeing the Fremont Rocket, I had no idea what he was talking about. It was pretty damn random, but that’s kind of Fremont in a nutshell. 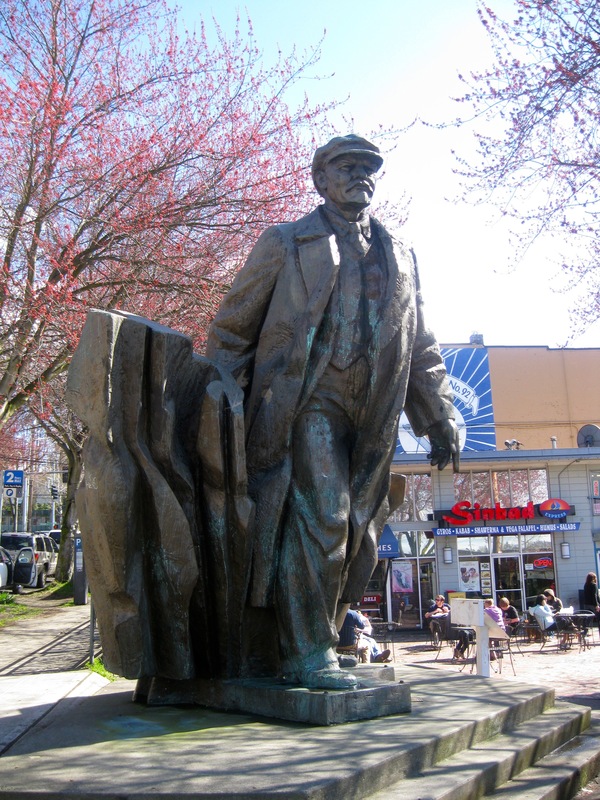 We also saw the Lenin statue. Apparently they put lights and a star on his head for Christmas. We’ll have to go back and check that out in December. The other highlight of the tour was stopping at Theo Chocolate. We were hoping to take the factory tour, but it was sold out. 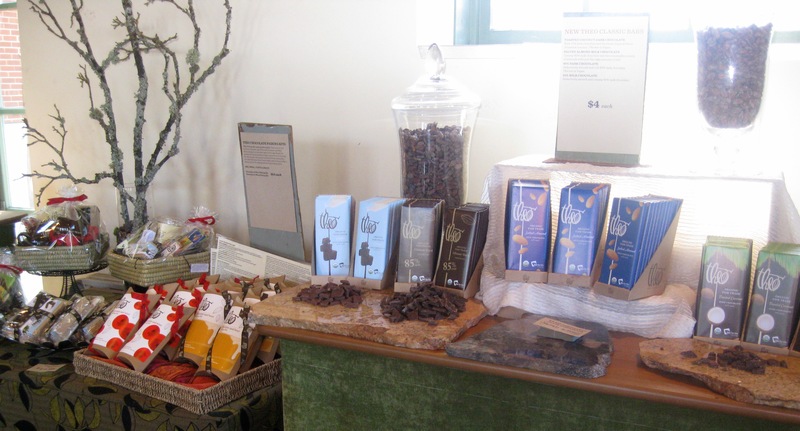 We consoled ourselves by sampling nearly every type of chocolate they produce. Seriously, if you’re ever near Fremont, I would hit up the Theo Chocolate factory and store front. I have already informed Brent we have to go back to take the tour. 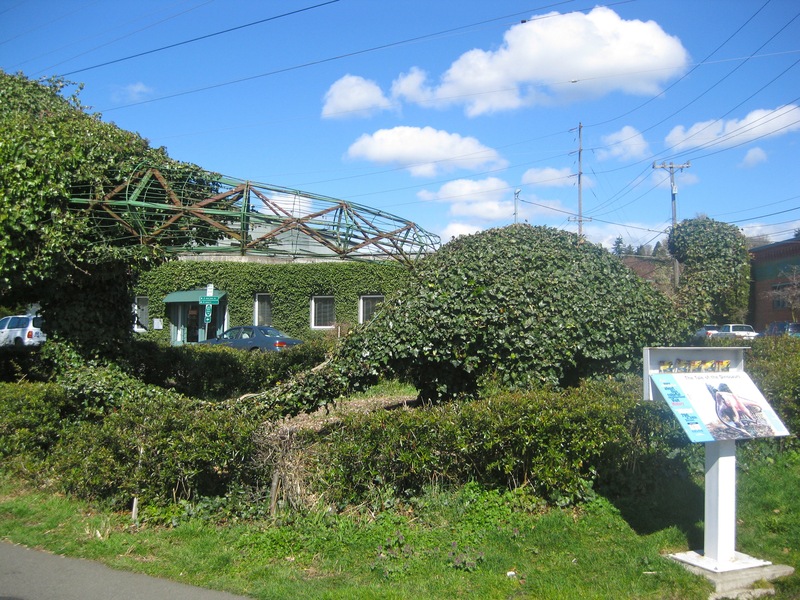 To complete the tour, we needed to check out the dinosaur topiaries. Fun story: we were all looking in the guidebook figuring out where to look for the dinosaurs when a nice gentleman asked us what we were looking for. We said “the dinosaurs” and he pointed 8 feet away from us. I think the fact we didn’t know we were staring right at them gives you a clue as to the disappointment we felt. This was definitely the dud of the tour. As you can see, one of them is still missing his ivy head. After stopping for a beer and some frites at Brouwer’s, we headed to Capitol Hill to see the Jimi Hendrix statue and St. Mark’s Cathedral. 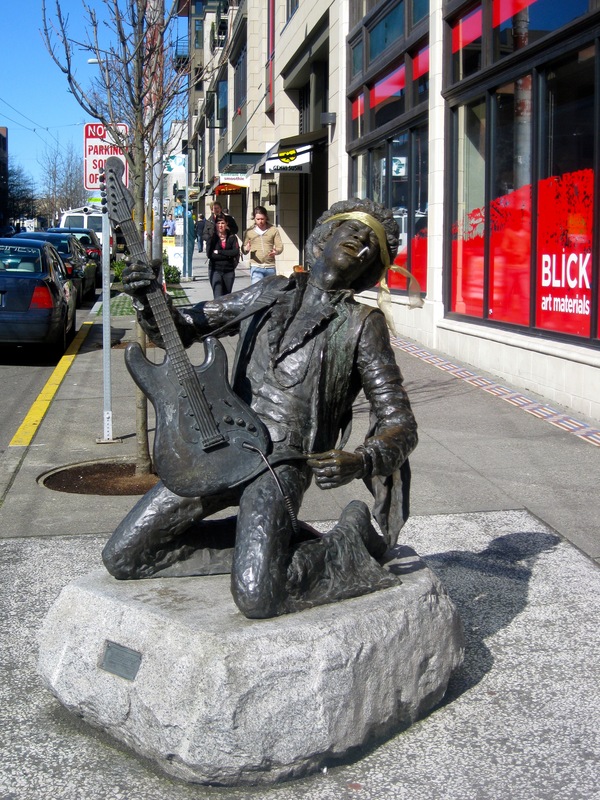 There’s been talk of relocating the Hendrix statue and I can see why. It’s in a bizarre location on the sidewalk in front of an art supply store. We also stopped to take advantage of happy hour at Quinn’s. Love that place. We had such beautiful weather and it was a really fun day. It definitely inspired me to get Brent and I out and about exploring more of this awesome city. 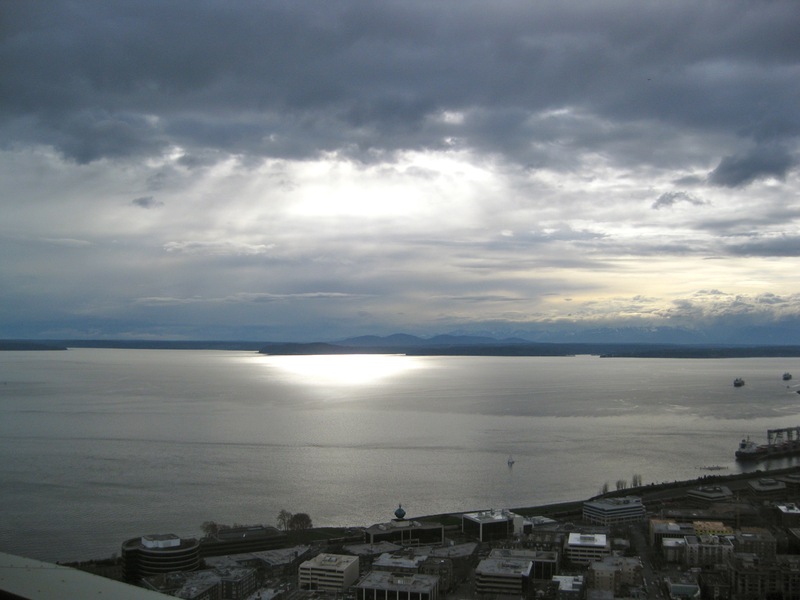 Posted in Uncategorized and tagged Art, Family, Seattle. Bookmark the permalink. Oh man, have I been busy! My cousin Pat and his girlfriend Smitha came to visit Seattle this past week and I tagged along and had myself a vacation in my own city. Yep, unemployment sure has its perks! 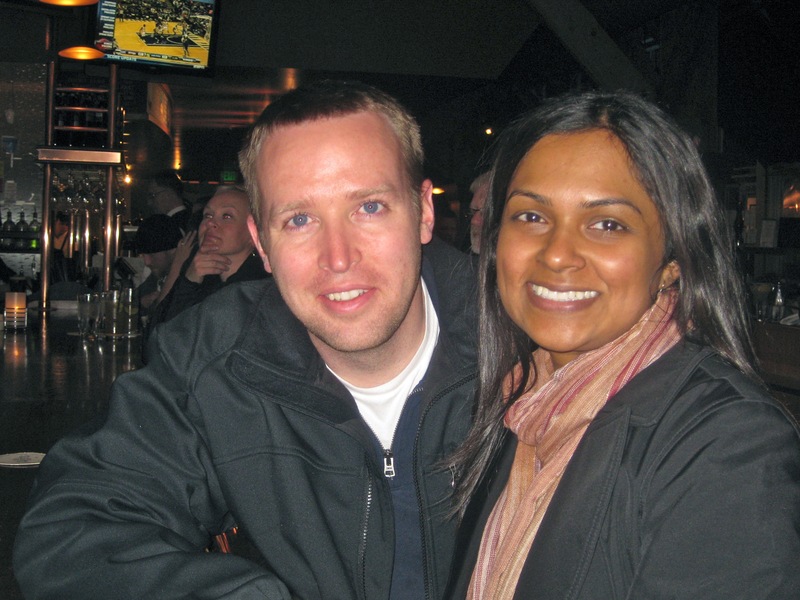 Pat and Smitha came prepared with a list of things they were interested in seeing, and of course restaurants they wanted to try – people after my own heart. After a delayed plane arrival on Wednesday night, they woke up Thursday ready to go, go, go. 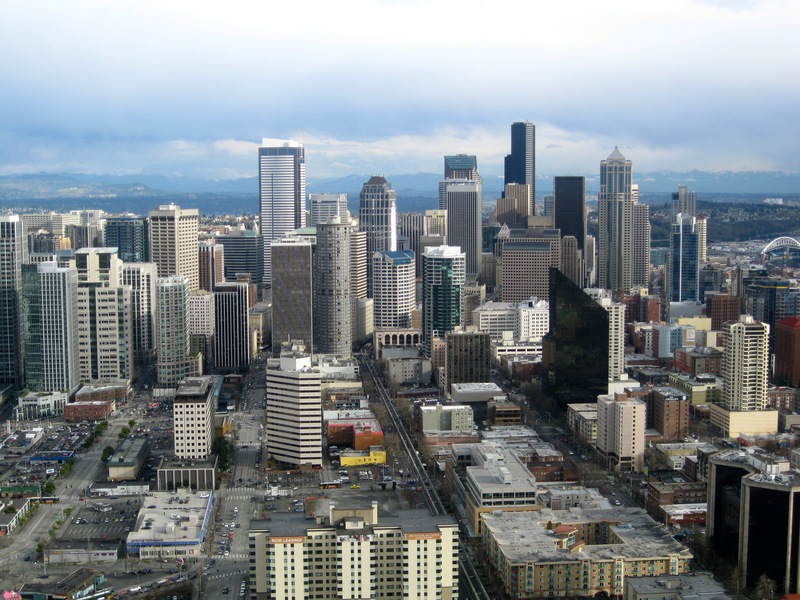 A walking tour of Seattle’s downtown core followed. We headed from my place to Pike Place Market, stopping for breakfast at Le Panier, which is one of my favorite places for a cappuccino and pastry in the city. We explored the market. I ooohhhed and ahhhed over a million things as usual, AND Smitha caught a fish! 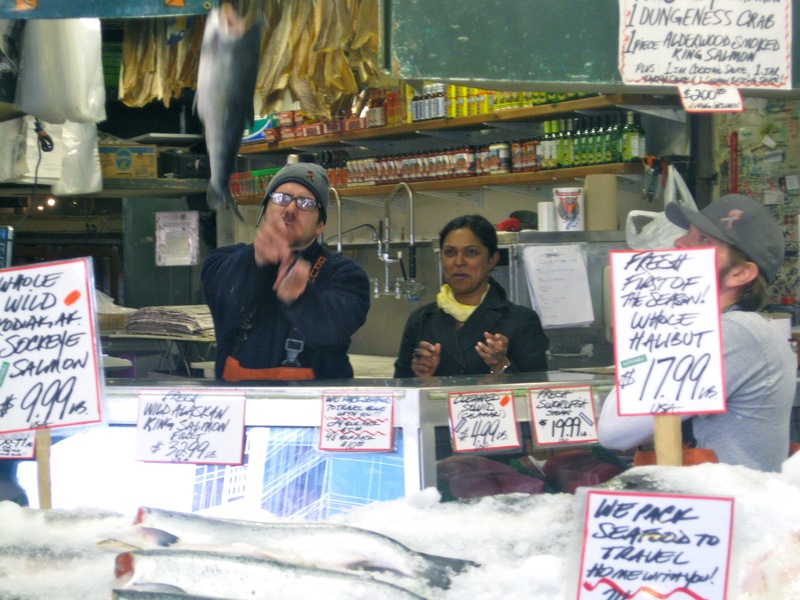 She wanted the fish mongers to start throwing the fish and they told her she had to catch one. She has more confidence than I did, because she did it. It took two attempts, but the second one was a success. Pat actually took a great video of it and we were dying laughing watching it. More wandering ensued, including a stop for a beer at Pike Pub & Brewery, where I greatly enjoyed the Tandem Double Ale. We stopped for lunch (#1 of 3!) at The Pink Door, and got to sit outside. 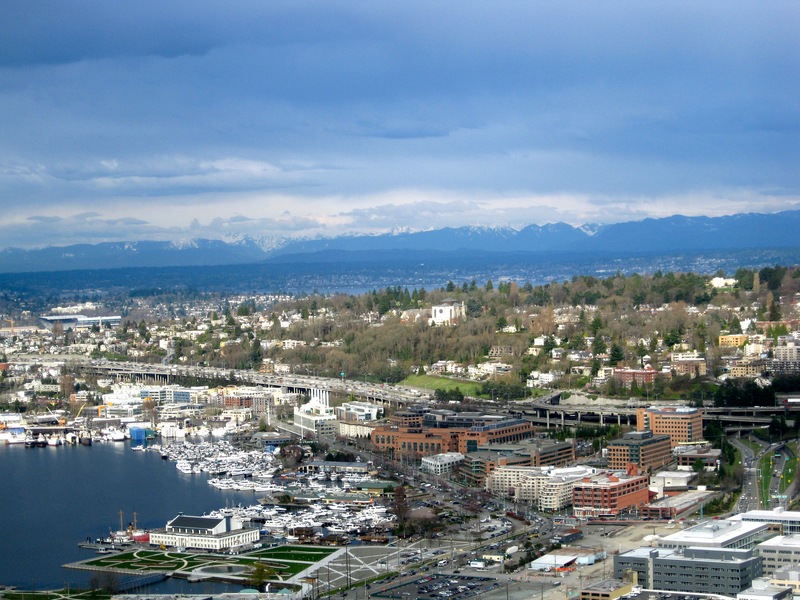 I am so excited about spring and summer in Seattle!! Pat and Smitha split the Pink Door Lasagna, which was a veggie lasagna and it was amazing. I had a bite and I would love to come back for me. 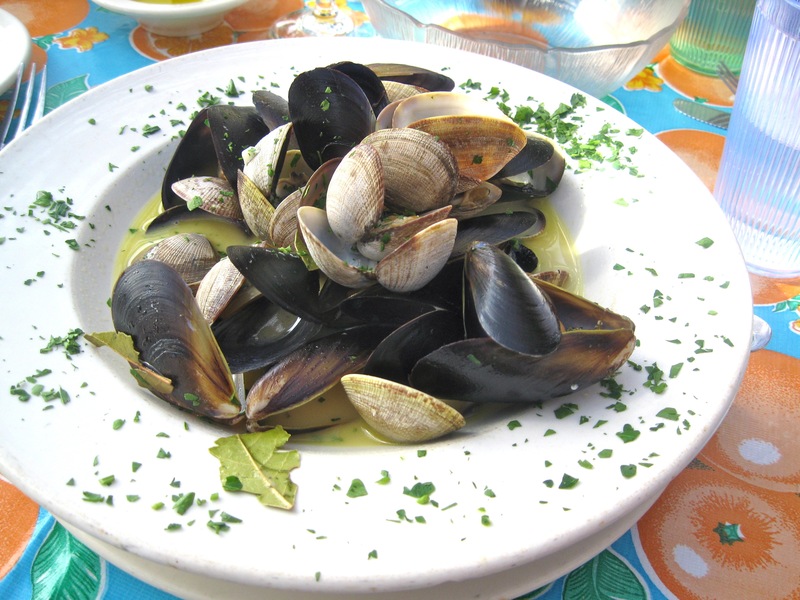 I ordered a glass of wine and some steamed mussels and clams, which I ate about half of. We moseyed on over to Pioneer Square, which is super adorable and took a look at all the public art in Occidental Square. Eventually we made out way to Salumi. Obviously we weren’t hungry, but I had been wanting to try it (and their hours are lunch only Mon-Fri) so I used their visit as an opportunity to do so. 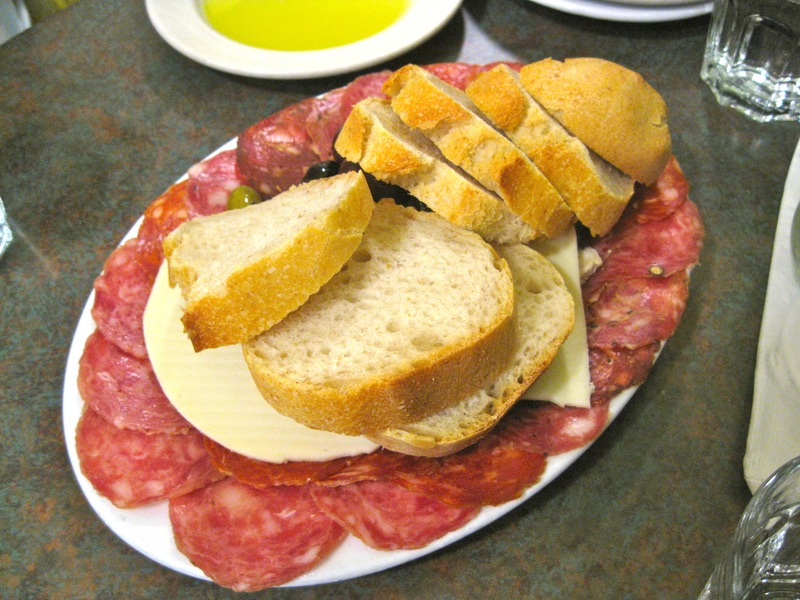 We split the cured meats plate, which made a nice snack (we didn’t quite finish). 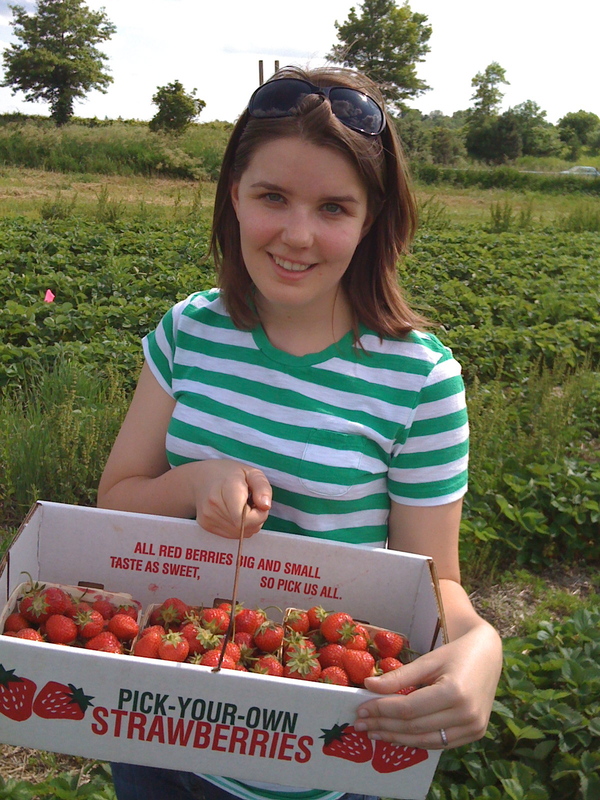 Ok, no way to beat around the bush here – we continued walking, so that we could make our way to Serious Pie. Yeah, a third lunch. I have history with Serious Pie. Brent and I went there over a year ago on our first trip to Seattle. To say it didn’t live up to the hype would be a huge understatement. We kind of swore we would never go back. But, I’m known for exaggeration, so when they suggested it, I decided it was time for a second chance. We hit it up for their happy hour. 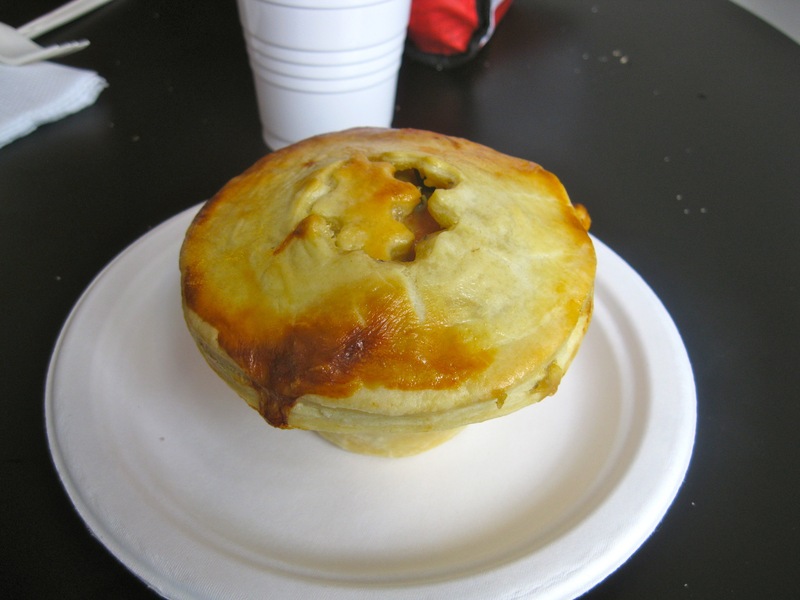 Mini pies for $5 and cheap beer and wine = redemption for Serious Pie. 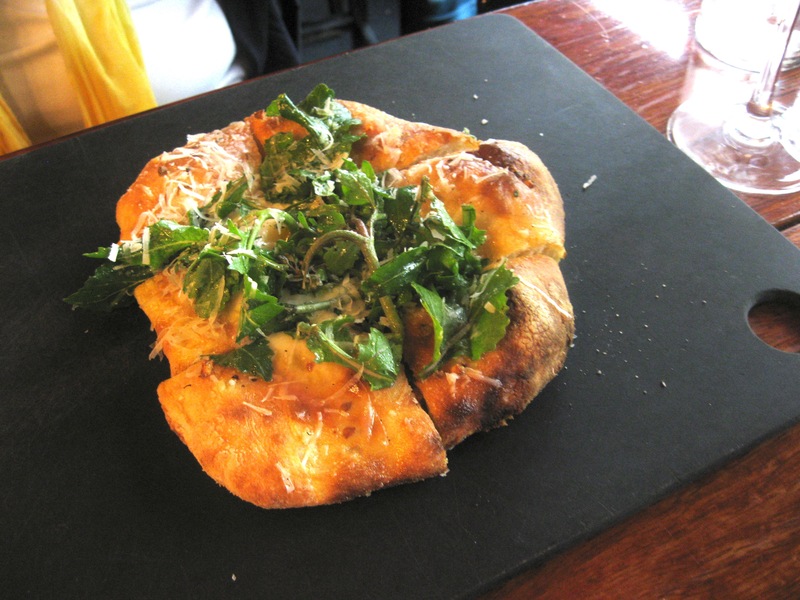 While I still think their pizza is a bit overhyped, I enjoyed each of the three mini pies I got to try. While I still feel hesitant to head back for dinner due to the much longer wait time and the higher price, I would definitely come back for happy hour. We definitely ate quite a bit during our walking tour, but we split everything so it was not near as much as it seems. I’ll be back later with more of my vacation at home. Posted in Uncategorized and tagged Seattle. Bookmark the permalink.